All of our engraving is done with a laser and will be sized to fit the engraveable area. Oak Barrels are normally engraved on the front barrel head in an area above the spigot. We will try to make the image as large as possible to fit in the area. Some images are wider than they are tall and others vice versa. We will try not to skew the image out of size but enlarge it proportionately to fit. All of our oak aging barrels have a center divot that is formed with they are cut in to circles. We cannot plot where it will fall on your engraving image and it may obscure a letter of text or part of your image. The center divot is relatively small and we are not responsible for making sure it falls in an open space of the engraving. You can see the center divot on this barrel head. All of our barrels have a logo branded on the rear barrel head. If you request a rear barrel head engraving it will be positioned above this brand and centered in the appropriate area. Oak barrels that are normally displayed on their head will be engraved on the side between the two center hoops. This usually applies to barrel mugs, cigar barrels, ice bucket barrels, wedding card barrels, barrel flower centerpiece, etc. Personalized stainless flasks are laser marked so they show up as black permanent marking on the stainless. Full size barrel heads are engraved to a maximum width or height of 300mm. This will leave an area around the edge of the barrel head that will not be engraved. 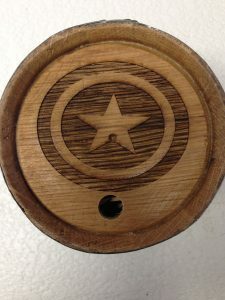 If you want your barrel head (not the barrels) engraved any larger to it extends to the edge there will be an extra cost to that and you would need to contact us to make this request and extra payment. Glasses and bottles are normally engraved so the image is viewed without turning the glass or bottle. Maximum width of engraving on a bourbon bottle is about 80mm and height of about 90mm. Glasses engraveable area is about 70mm wide by about 60mm high. Flasks and other items are engraved to a size that will fit the area. Template usage – If you choose to use one of our templates for your engraving we will use the fonts shown in the template image by default. You can choose another font option but you must choose one of our fonts listed and let us know what number you want and the text you want to use it on in the personalization field before you add the product to your shopping cart. Your custom image uploads – Be sure to only send us a black image on a white background for custom engraving. No color or gray areas are allowed. If your image is too small or low resolution then we will contact you for a replacement image before we proceed with your order. Please send only JPG, AI, PDF, BMP, GIF image types. Normally a 300 dpi image with a size between 8-15 inches will work well for us. Engraving proofs – If you request an engraving proof before we proceed with your order then we will email you an image of your personalized engraving BEFORE we engrave it. We will wait to hear back from you via email before we proceed. The faster you reply the faster we can engrave your barrel and ship your order. Make sure to are on the lookout for an email from support@barrelengraver.com.